Protection against autograph seekers. Update to this story. Guns for me, but not for thee. The National Rifle Association taunted gun control activist David Hogg and his group’s Saturday protest at its Fairfax, Virginia, headquarters by noting his security. 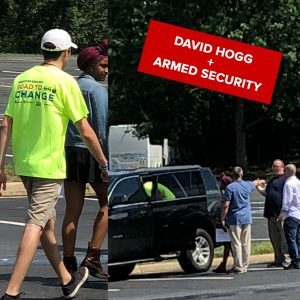 With the tweet, the NRA also posted a photo of Mr. Hogg getting into a black vehicle protected by gun-wielding security. Despite being tagged in the tweet, Mr. Hogg did not contest the NRA’s claim or reply directly to it. He also did not spend Sunday away from Twitter. Remarkably, for a group that, according to Mr. Hogg, wants to kill American schoolchildren and has blood on its hands, there was no bloodshed when some NRA employees mingled with the gun-control protesters. “Our social team chatted up the crowd and ended the day with ice cream paid for by @Everytown! Stay tuned for video interviews,” the NRA wrote.